We are passing through time and moving forward with new ideas. The list has arrived. It is strong, rich, saturated. The “2012 Colors of Spring” have arrived and they sound as delicious as they look. It really must be a daunting job to name the colors when you think about it. Who would know what we are talking about if we mentioned “Breathless” as a fresh new shade? In your minds eye what do you envision with the words: Tango, Solar Power, or Cockatoo? You can see how some names are so perfectly descriptive and others are just confusing. We choose our lipstick and nail polish not because they are red, but because they are Merlot, salsa, and lady bug. So much trust and persuasion each name holds. Somehow managing to convey the exact emotion, inspiration, and delight we are seeking in a color’s “personality”. The 2012 colors do not disappoint. We are graced with names like hyacinth, poppy, and geranium. Colors from the earth like ink and sandstone play as the neutrals. Also yummy honey and orangeade made the list. And of course, such springtime visions as canary, Tiffany blue, and grass will round out the top ten. 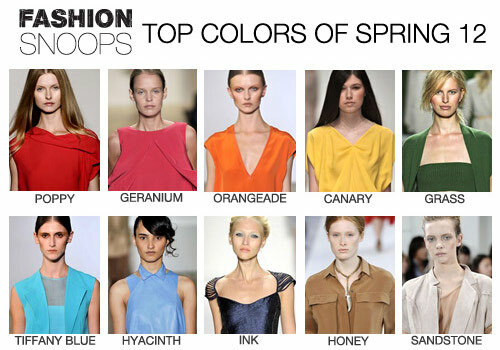 The spring 2012 colors are refreshing and bright. They were the inspiration for Saint Vintage’s new line. This jewelry collection is provocative and refreshing. The colors will enliven your wardrobe with a jolt of energy as warm and as fresh as their names.